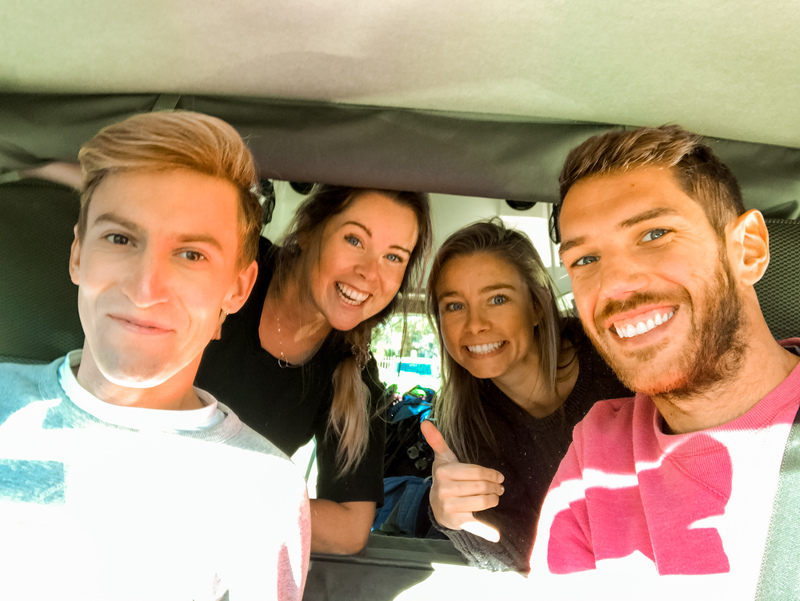 If you’ve been following along on my Instagram (@nikkitravelled), you might have seen that I finished my four-month stint in sunny Australia with an epic weekend road trip! 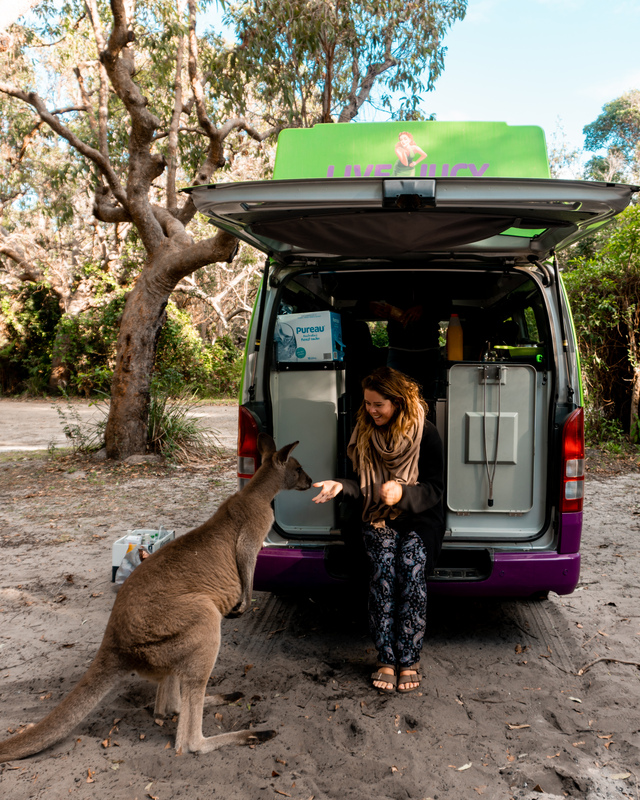 So, for my final long weekend, we teamed up with lovely folks at JUCY to take their Condo van north from Sydney to Byron Bay. Friends of ours, Lynsey and Aki, were competing in the Byron Bay Triathlon and we wanted to head up there to cheer them on from the sidelines and take a peep at this iconic Aussie town at the same time. If you’re looking to do something similar, I’ve outlined our 4-day itinerary below or if you’re just here for the cute ‘roos, take a peep our video for the best close up! As our cheerleading services were needed in Byron Bay early on Saturday morning, we decided to dedicate the whole of Friday to get ourselves, and our van full of supplies, up to Byron Bay. While it’s a pretty straightforward drive, it’s long. So, make sure you have some buddies to share the load, plenty of rest stops, awesome playlists and van snacks. One of the places we stopped off was Stockton – about two hours from Sydney. Apparently, at certain times of the year you can see baby great white sharks off the pier, but while we were there, it was just a few dolphins playing in the shallows. We also stopped off in Port Macquarie for dinner and a good food shop. Google maps told us it would be a 9-hour slog, but with all our stops (including mine to a pharmacy to get antibiotics for post-Philippines eye infection – oh the glamour! – and plenty of coffee) we pulled up to our campsite at Byron Holiday Park at about 11pm. Dinner that night was tuna melt toasties (cooked in the back of the van American-style in a frying pan!) and some well-deserved beers. After a great first night sleep in the Condo (there are two double beds, one that pulls out from the top roof section, and one folds out from the seating area) we were ready to explore Byron. 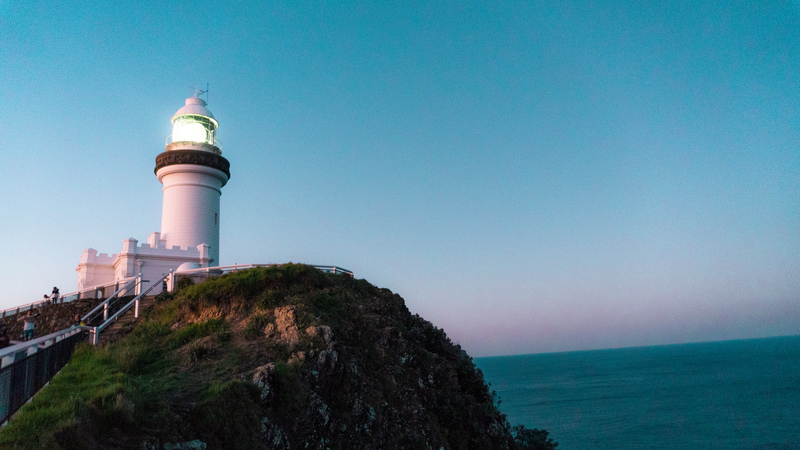 The Byron Holiday Park is just a 5-minute walk from Tallow Beach so we decided the best way to get to Byron Bay, see Cape Byron Lighthouse, and to be at the starting line for Lynsey and Aki was to walk the long stretch of beach. Along the way, we spotted some more pods of dolphins in the surf as we walked towards the lighthouse. After a great brekkie in the sun at Novella, we were ready to cheer til we lost our voices. Of course, Lynsey and Aki absolutely smashed it and finished the 1.5km swim, 40km cycle and 10km run like powerhouses! That night, we had a celebratory dinner at Trattoria Basiloco and the guys still managed to stay out for froyo and drinks that night. Real life superheroes. After spending the morning with the team in Byron, we needed to hit the road to get to Arakoon. 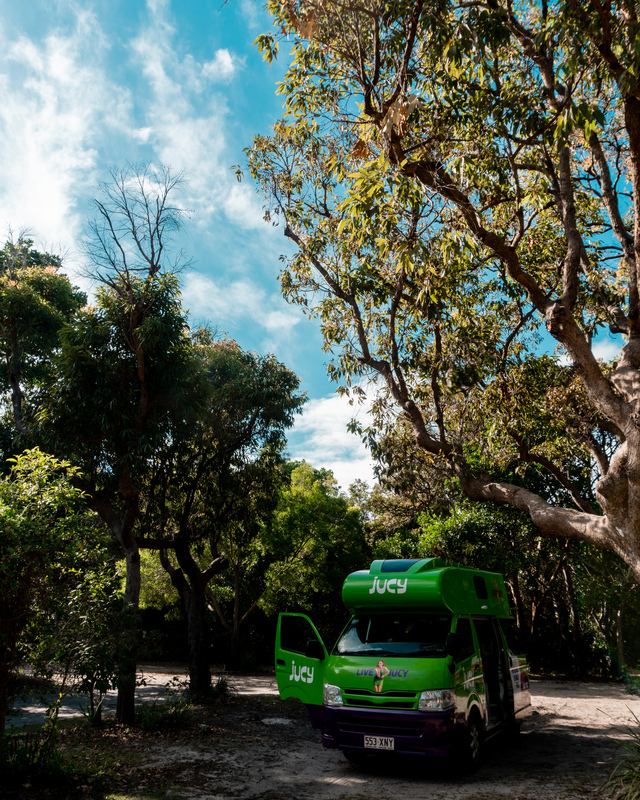 We’d found the Smoky Cape Campsite with the Campermate app before we left Sydney and really didn’t have any expectation, other than it was cheap, and near the beach. And it was so good and now one of my favourite spots in all of Australia! Firstly, we were treated to a completely deserted beach for sunset and the sky was lit up pastel shades of pink and purple, while these wild waves crashed so hard we thought it was thunder. Then, as soon as it got dark, a lightning storm started up out at sea so we all wrapped up and watched the horizon light up, or catch a falling star in the perfect sky above. Never in my wildest dreams, did I think I would be having breakfast with a roo. Look at this little guy’s face!! 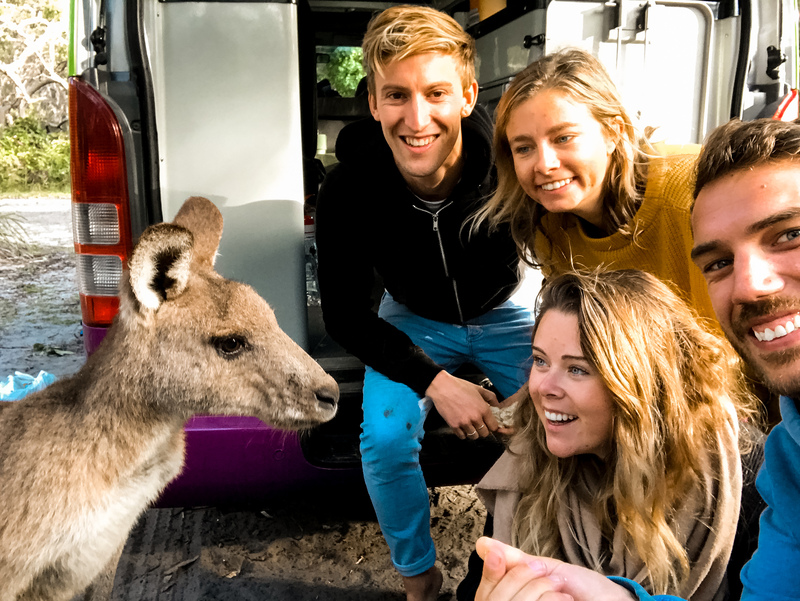 While we had spotted a few roos in the campsite the night before, they hopped off as soon as we got too close with our cameras so we didn’t expect any to come this close to the van. Well, this little guy practically wanted to sit in and have coffee with us! Sadly, after that, it was time to get back on the road to Sydney to return our JUCY van. But it was the perfect way to say goodbye to Australia – by the beach, with friends and a camera full of happy memories. I can’t wait to get back and plan some more road trips with this awesome bunch!